The three figures below show the effect of a one-degree error in the tilt angle on the plane of the array irradiance for key times of the year. At the equinoxes, the error is negligible. At the summer solstice the error is negative (defined as (POA36.05° – POA35.05°) and lasts longer due to the long summer day. At the winter solstice the error is positive but is shorter in duration due to the short winter day. The effect on the annual POA irradiance is a very small negative error (-0.04%). Irradiance effect of 1 degree error in tilt angle for a latitude tilt PV system in Albuquerque, NM at the equinox. Irradiance effect of 1 degree error in tilt angle for a latitude tilt PV system in Albuquerque, NM at the summer solstice. 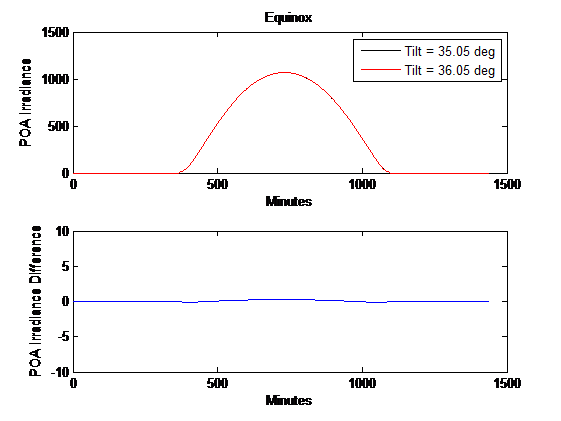 Irradiance effect of 1 degree error in tilt angle for a latitude tilt PV system in Albuquerque, NM at the winter solstice. The annual effect of an error in tilt angle changes with the tilt angle. 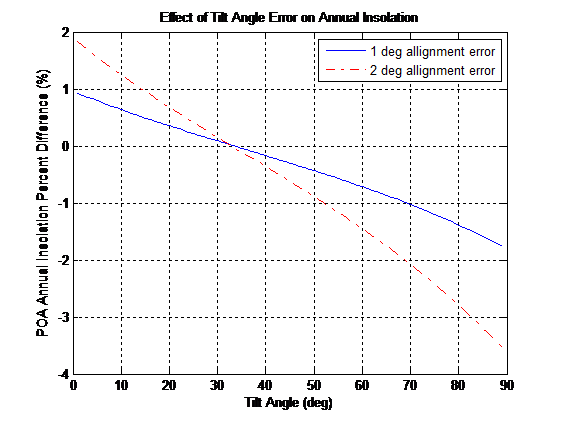 The next figure shows this relationship for both a one- and two-degree error in the tilt angle. Note that the error is least at a tilt angle that is near latitude tilt. Thus errors in the tilt angle have a greater effect for horizontal systems than for latitude tilt systems (unless your system is at the equator!). 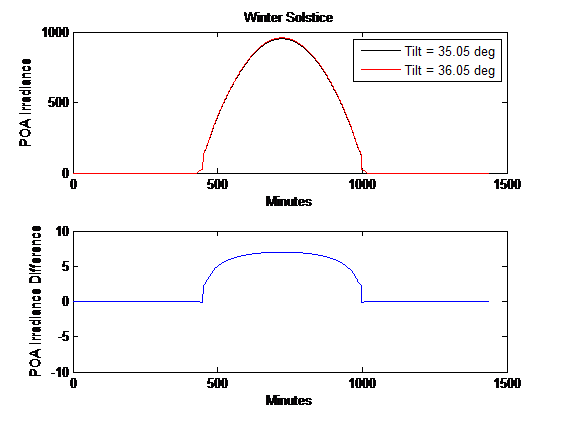 Insolation effect of small errors in the tilt angle as a function of the tilt angle.